Aplat is a San Francisco-based company designing sustainable culinary totes to carry and share food, bread, wine, and garden. Zero waste in design and manufacturing, for a beautiful sustainable lifestyle. Our standard plat and larger plat wide totes are our best sellers. Their unique origami design allows an the flat canvas tote to expand with great volume. 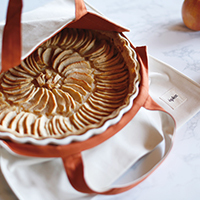 Carry pies, casseroles, and more upright with spills and with eco-conscious style. 15" x 15" (flat) with center opening. Holds 12" round or square dish and platters. Double 13” straps sewn in load bearing areas and reinforced with industrial stitches. Totes are carefully handcrafted in San Francisco, CA. Designed for zero-waste kitchens, our unique rectangle cotton covers come in two sizes and are a sustainable solution to covering casseroles and pans. The easy drawstring closure eliminates toxic elastic bands and provides a more secure fit. Constructed of extra durable and breathable 100% organic cotton canvas, these covers are made for repeated wash and reuse . Say no to plastic and toxic elastic. Medium fits rectangle pans and casseroles up to 9”x13”. Large fits rectangle pans and casseroles up to 12”x15”. 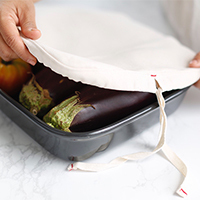 Our zero waste designed medium round bowl covers come in three sizes and are a sustainable solution to storing leftovers, sauces, and produce. The breathable 100% organic cotton works great for protecting rising dough and covering batter. The easy drawstring ties provides a snug fit and eliminates toxic elastic bands. Made from extra durable preshrunk cotton canvas, these covers are made to last for years. Just wash, reuse and say no to plastic and elastic. 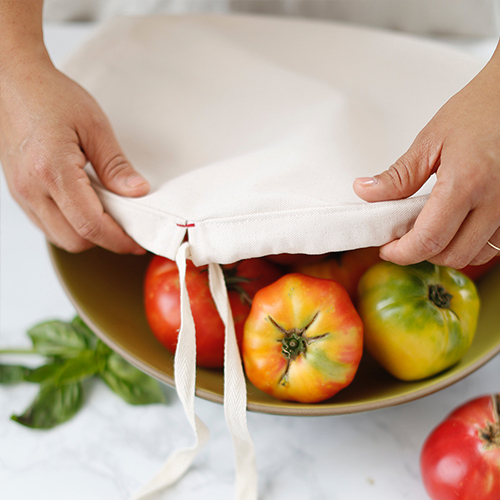 These round covers are the perfect accessory to our plat tote. Small cover fits bowl sizes up to 8” round. Medium cover fits bowl sizes up to 10" round. 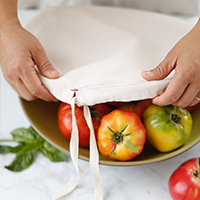 Large cover fits bowl sizes up to 13” round. Made from extra durable and breathable organic cotton, the pouches keep food fresh longer and are made to last for years. Great for bread, grains, herbs, fresh produce and much more. We love them to transport everyday lunches and snacks. Perfect for the refrigerator and freezer! Simply wash, reuse, and reduce single use plastic and toxic elastic from your home. Extra Large pouch 18” x 13" with 3” gusset and 18” opening. Poche Large, 9” x 13", 3” gusset and 13” opening, double cord drawstring. Poche Medium, 7” x 13” with 2” gusset and 10” opening, double cord drawstring. Pochette Extra Small, 7” x 7”, 2” folder over closure, sandwich bag size. Baguette Tote, 9" x 21" with a 31" long over the shoulder strap top closure. Engineered to stand upright on the kitchen counter. High quality preshrunk 10oz 100% organic cotton canvas produced from environmentally friendly sustainable fibers. The horizontal wine tote is designed to hold one bottle and features three side pockets for small cups (two stemless), food items (cheese and crackers) and accessories (bottle opener and bar tools). 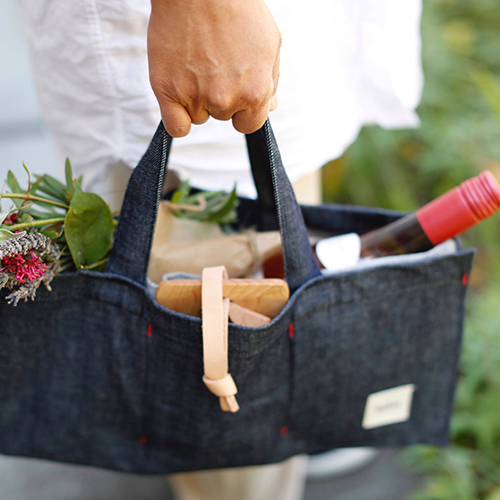 Perfect for casual picnics, gifting wine and cocktail kits. The vertical wine tote is designed to hold two bottles, with an interior sleeve for added protection. The adjustable strap can be carried from the top or slung over the shoulder. Perfect for casual picnics, toting wine and gifting for all occasions. Horizontal Wine Tote, 7.5" x 15" (flat). Holds one bottle and demi baguette. 3 side pockets for small food items and accessories. 13" straps sewn in load bearing areas and reinforced with bartack stitches. Vertical Wine Tote, 9" x 13", interior vertical 6.5" sleeve protects bottles from clanging. Holds two standard bottles as wide as 4 1/2” in diameter vertically, or a baguette and bundles of flowers. 23" strap sewn in load bearing areas and reinforced with bartack stitches. Made of high quality preshrunk 10 oz 100% organic cotton canvas produced from environmentally friendly sustainable fibers. Double layer heavy organic cotton canvas or surplus denim. Locally sourced surplus chambray, denim or cotton lining. Made of high quality surplus raw denim, locally sourced. Indigo color and weave may vary based on season. The large grand market tote is extra-wide for transporting everything under the sun. Double up on casseroles and dishes or carry farmers market and everyday grocery items. Perfect for picnics, weekend road trips and camping. 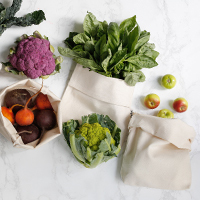 This long and shallow tote is great for gardening and foraging out in the wild. We love it to hold all our zero waste pantry pouches to the bulk store. 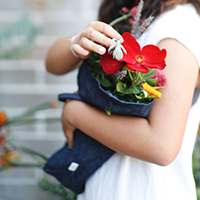 The reusable jardin flower tote is designed to hold flowers, garden stems and herbs. The two straps wrap around and tie in front for easy bundling, while the back-seam opening easily hooks on a wall or doorknob to hang vertically. Perfect for gifting bouquets, for wedding parties and special occasions. Surprise someone special by leaving a “sac a fleur” on the door knob to find when they come home. Market tote, 15” x 10 x 30” with a 30" wide opening with two sturdy 27” straps. Jardin tote, 10" x 17" (3" back open seam) with two 20” straps designed to tie in front or pull up to carry flowers.